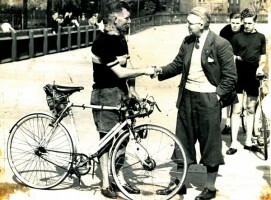 Tommy Godwin covered an unbelievable number of miles on his bike in 1939. A record that will likely stand for the rest of time. Read his incredible story below. How many sportives are you planning to ride this year? How about all of them, six times? A glance through the 2012 sportive calendar shows around 160 events covering over 13,000 miles of British riding. It would take a seriously committed cyclist to ride all of these events in a single year. Riding them all nearly six times would be inconceivable, but that is exactly what Tommy Godwin did on his bike in 1939. The cycling year record was conceived in 1911, born out of a competition run by this magazine, which challenged amateur cyclists to ride the highest number of centuries in a single year. The competition was aimed at amateurs, and the first winner was Marcel Planes, who rode 332 100-mile-plus rides, notching up a highly impressive 34,666 miles in a single year. Controversy struck, though, when Planes was found to be a sponsored rider, calling his amateur status into question. The mileage record stood until 1932, when Arthur Humbles set out to reclaim it as a display of the capabilities of the amateur cyclist. He added an additional 1,341 miles to Planes’s total, ending up with 36,007 miles. The cycle trade began to take notice. These record attempts were getting a reasonable amount of publicity, and what better way to show the reliability and longevity of a bike than have it break the year mileage record? Up stepped a new calibre of rider, and from 1933 onwards the record was pushed increasingly higher, culminating in 1937, with a staggering 62,657 miles by the Australian pro Ossie Nicholson. Brief mention must be given to Walter Greaves, the one-armed communist amateur from Yorkshire, who rode a customised gripshift bicycle to a staggering 45,383 miles in 1936. Greaves rode on through harsh weather, numerous crashes and a brief period in hospital finishing on new year’s eve, having ridden an average of over 130 miles per day. In 1938 there was no attempt upon the record. The British riders sat quietly seething at Nicholson’s 1937 performance. Riding as a professional, he had beaten two British contenders to push the record to a seemingly insurmountable mileage. It was time to reclaim it for Britain, and on January 1 three British riders set out to do just that. 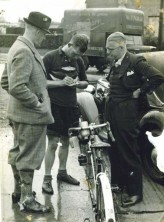 Edward Swann was the least known of the three, and retired with 939 miles in the bag after a particularly bad crash. This left Tommy Godwin and Bernard Bennett to slug it out for the rest of the year between them. 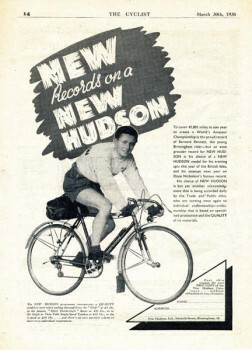 Bennett had attempted the record before, riding a credible 45,801 miles in 1937 but seriously eclipsed by Nicholson’s massive total. Tommy Godwin was a newcomer to the year record, sponsored by Ley Cycles to bring the record back home. Coincidentally, cycling has two Tommy Godwins. This one is not the Olympic medal-winning Tommy Godwin still alive today. Our Tommy was born in the Stoke-on-Trent area and turned from a grocer’s delivery boy furiously pedalling his heavy bike around the Potteries into one of the best British time triallists of his generation, winning many prestigious events. The two riders could not have picked a worse year to begin their attempt. The winter of 1939 was truly dreadful with sustained snow and ice blanketing a large portion of the country. The wily Godwin chose to ride in the few remaining areas that were clear of frost. Bennett slipped behind, hindered by the inclement weather conditions. Godwin battled on despite numerous crashes, awful weather and short days. In January and February 1939, he forged ahead of Nicholson’s previous rides by averaging nearly 160 miles a day. Bennett lagged over 2,000 miles behind. Remember, these riders were tapping out their mileages on steel-framed bikes with heavy hub gears, encumbered by dynamo lighting. Their bikes and equipment exceeded 35lb in weight and were ridden on roads devoid of the smooth tarmac we are accustomed to today. The daily mileages required riding in the dark. In some winter months, only eight hours of daylight are available; Godwin regularly pushed distances over 200 miles, which would have required at least four to five hours of riding in the dark. The dynamo-powered lighting of the 1930s does not compare with modern, bright LEDs. To compound matters further, war was on the horizon, and later in the year blackout restrictions forced the riders to tape their lights after dark. However, the two men refused to be deterred by these hardships. Egged on by each other and their sponsors, their monthly figures quickly began to dwarf those set by Nicholson. Bennett took the honours between March and June, consistently riding further than Godwin each month and clawing back Godwin’s advantage. In July 1939, Godwin rode a massive 8,583 miles in response, barely pausing for sleep, as both riders were being paced by other riders or their sponsors setting mileage objectives. It had got out of hand, and by mutual consent the pacing ceased, leaving the riders to complete the year riding solo. In May, Godwin’s sponsor changed to Raleigh, as Ley Cycles had been unable to fund the attempt any further. 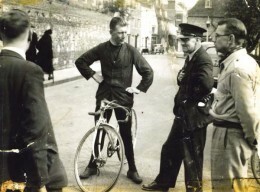 Godwin was provided with a state-of-the art machine, the Raleigh Record Ace, complete with a Sturmey-Archer four-speed hub. Even with the absence of pacing, Godwin and Bennett’s miles continued to pile up. Godwin passed Nicholson’s record on the October 26, 1939, with two months and five days to spare. Bennett achieved this distance nearly a month later, then climbed off his bike and answered the call to war. 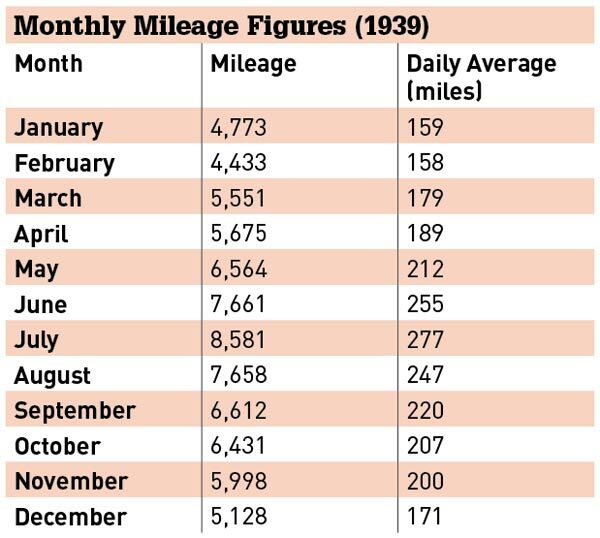 Godwin was allowed to continue, and on December 31, 1939 he’d racked up a massive 75,065 miles. But Tommy wasn’t content to settle with that – he continued riding until May 14, 1940, setting the record for the time taken to 100,000 miles – within 500 days. Godwin’s achievement was legendary beyond cycling fans. He met royalty, appeared on television, was interviewed by Richard Dimbleby for radio, and lent his image to advertising posters. The ride had taken its toll, though; Godwin required a period of rehabilitation to learn to walk normally and uncurl his hands. Yet within weeks he was serving his country in the RAF. Godwin was always a quiet, modest man. Consequently, his achievement slipped from the cycling radar with only a brief discredited claim surfacing in 1972 when Ken Webb claimed to have beaten it. So next time you’re feeling the pain at the end of a long day in the saddle, think back 73 years and imagine Tommy. He’s probably feeling as tired as you, yet he’s got another 100 miles to ride. In the 365 days of the record, Godwin only took a single day off in order to meet the Prince of Wales. He had little time for his diary, which simply contains the mileage numbers, and so a typical day of his record attempt must be pieced together from magazine interviews. On July 21, 1939, this magazine followed Tommy for a day to verify that he really was riding the distances he claimed. Tracking devices did not exist in 1939, so Tommy’s mileage was verified by a sealed milometer and cards signed by upstanding members of society such as police officers or postmasters. These cards were then posted daily to Cycling for verification. Cycling sent editor H.H. England to keep an eye; consequently Tommy put on quite a show. He’d rise at 4-5am and get straight on the bike, eschewing breakfast in favour of chewing gum. Fifty miles later, he’d grab something to eat: eggs, tomatoes, rolls and butter, marmalade and tea or lots of water. Tommy was a committed vegetarian after a bad experience in a Burslem pie maker’s where he had worked. In the first half of the year, he was accompanied by his sponsors and paced. On this particular day, he’d ridden 126 miles before noon, stopping briefly to eat bread and cheese at 11.30am. It appears that he was aiming for Land’s End, which he may well have achieved, as he ended the day with 348 miles on the clock. At the height of the record Godwin was surviving on 40 hours sleep per week. He slept in fields if necessary, but was often taken in by cycling friends, who said: “Many a time Tommy turned up here completely exhausted and we had to bath him and put him to bed. Sometimes he was so wet we had to take off his clothes and wring them out.” Bear in mind, he rode in woollen clothing. Prior to the record, Tommy Godwin was a highly proficient time triallist, anecdotally credited with hundreds of wins, the first achieved on his grocery delivery bicycle. Records state that he was seventh in the 1933 British Best All-Rounder competition, averaging 21.255mph over 25, 50, 100-mile and 12-hour time trials. Tommy loved racing, and on the way to his 100,000 mile record, he rode an exhibition 120-mile ride along the well-known Pilgrim’s Way. He managed this at an average speed of over 20mph, finishing in six hours 8mins 43secs. The switch to Raleigh during the record year caused problems. As a sponsored rider, he was deemed a professional. This immediately excluded him from all amateur racing, and the cycling authorities refused to relent. Godwin turned his attention to mentoring, using his grit and experience to spur riders on in the Stone Wheelers cycling club. They nicknamed him ‘the Whip’, and he was a familiar sight standing by the side of the road grimly telling the riders they were “down” regardless of their actual performance. Tommy had no time for whining – he was a tough rider who’d carried on with his record attempt even after breaking a collarbone. He’d used a tube to strap up his shoulder and continued to ride one-handed. This affected the healing of the collarbone, which in turn was deemed to be a contributing factor in the heart attack that killed him, aged 63, in 1975. Fittingly, he was out riding his bike with friends. Sadly, the only memorial to this great man is a plaque commemorating his achievement in the doorway of the Fenton Manor sports complex in Stoke-on-Trent. It was an idle boast in the pub that sparked my interest in Tommy Godwin. I was boring my acquaintances with details of a 90-mile ride that day when my friend Bill leaned forward and informed me that Tommy Godwin had probably ridden three times that distance. I’d never heard of him or the year record but surely Google would know? There was very little: a few mentions on message boards but no Wikipedia entry and nothing outlining his year. As an endurance cyclist, I needed to know more. Fortunately, a magazine editor put me in touch with his family and the story began to unfold. Tommy’s generosity was legendary. He’d given away almost every item of cycling memorabilia he’d owned. 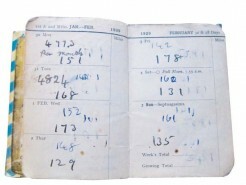 His family had very little but knew that he’d kept diaries during the record detailing his daily mileage. I needed to track these down. Many phone calls, letters and emails to his old cycling friends proved fruitless, until Paul Swinnerton of Swinnerton Cycles mentioned that Neil Hemmings may be in possession. Neil’s mother and father were Tommy’s greatest friends. Sadly they’d passed away, but Neil had the diaries and kindly leant them to me. I spent hours painstakingly comparing the mileages with those published in cycling magazines held in the Coventry History Centre. I also read through hundreds of old cycling magazines and newspaper articles to piece together the riders and their rides. I created a Wikipedia page outlining Tommy’s achievement; this stimulated the contribution of others who added profiles of the riders who had gone before, and filled gaps in my knowledge. The next question was how to tell the current generation of cyclists about the record? So I turned to Twitter and a little bit of programming to create an account in Tommy’s name that tweets his mileage every day along with an equivalent bike ride. You can follow this account, @yearrecord. My interest and research continues as I strive to unearth the full story of the cycling year record from inception to present day. 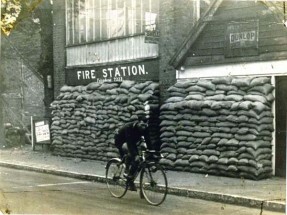 This involves scurrying through cycling archives held at Warwick University, Coventry History Centre and by various organisations such as the Veteran Cycle Club and the National Cycle Museum. If you have any information that can help my research, please email me at dave@phased.co.uk.